It’s taken me a while to finish this post. In fact, it took almost three months to write a post which should really just be about going to watch a basketball game, being the third of three US sports that were ‘in season’ during our visit – hockey, baseball and basketball (NFL had finished in January). But it’s taken me so long to get it done because it’s the first time I’ve written about as serious a topic as this one (oh, and also I started a new job and had multiple trips out of town on weekends). At one stage I was worried this would be my Chinese Democracy, or Avalanches new album, always sitting unfinished. Why is it a serious topic? Well, it started because this happened. As you would expect, I had rigorously analysed the draw to work out how I might be able to go and watch some Basketball. The NBA regular season would end on April 15, midway through our trip. As a follow on from following the Red Sox, my nominal NBA team has been the Boston Celtics. I looked at the possibility of watching them play in Atlanta before we went to the Masters, but the netball Hong Kong trip wouldn’t allow it. I looked at games in Chicago, but we had commitments that would prevent us going. This meant I would have to hope the playoffs draw worked in our favour. My first hope was that the Brooklyn Nets would play their first playoff match while we were in New York – and I could watch former Boston players Paul Pierce and Kevin Garnett in action for the Nets. But, Toronto had home court advantage for the first game while we were in New York. Finally, we might have been able to see Miami Heat v Charlotte, but our plane arrived in Miami about 10 minutes after the game started. 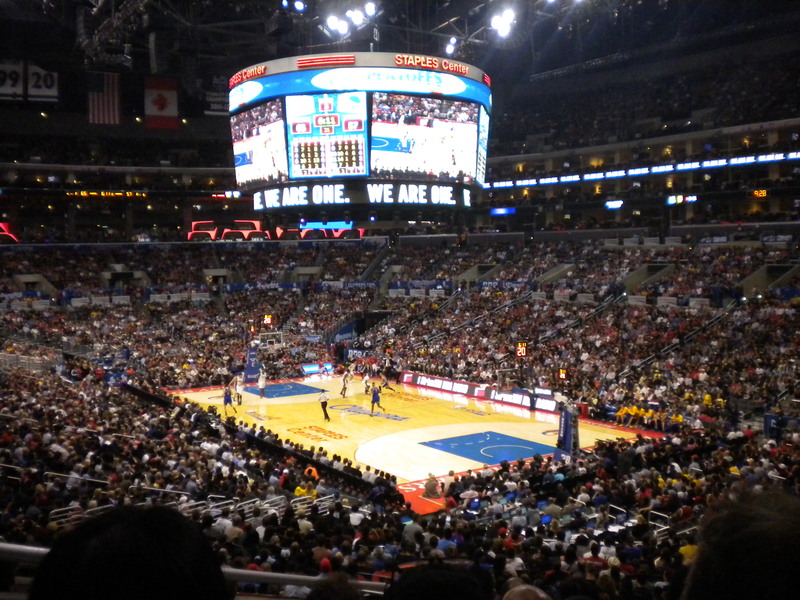 So, looking ahead to the last night of our trip, I noticed the Los Angeles Clippers and the Golden State Warriors were scheduled to play game 5 of their 7 game series at the Staples Center in LA – and we would be in LA then too. We would get to see a game – but only if it wasn’t a 4-0 sweep! 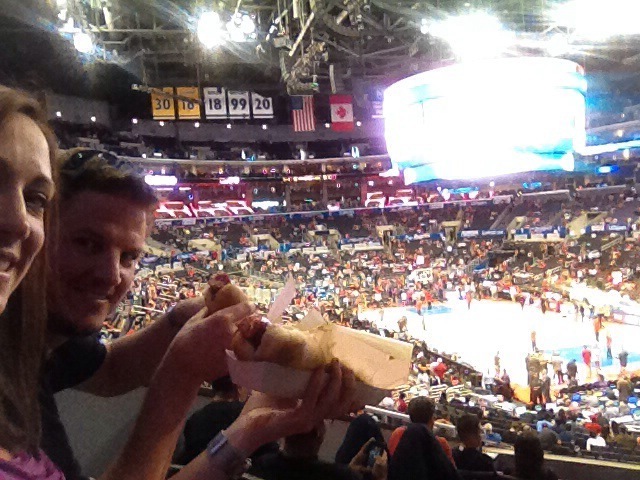 When the teams split the opening two games, guaranteeing the need for a 5th, we got tickets for the Clippers match. We bought the tickets, then news broke of a major controversy. Clippers owner Donald Sterling had been recorded making racist comments and gossip website TMZ had released the tape to the public. The picture above was the trigger. 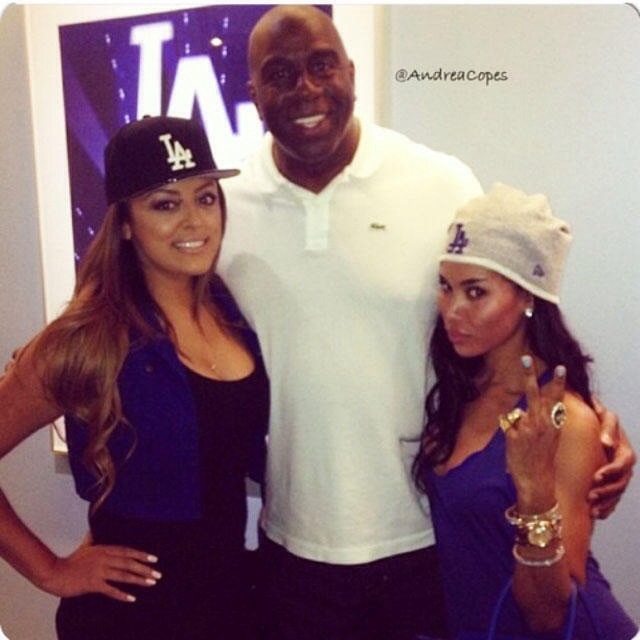 Sterling’s girlfriend, V.Stiviano, had posted the above picture with basketball legend Magic Johnson on Instagram. In response, Sterling told her “not to bring black people to games”. Hypocrisy much? The majority of the team’s playing roster and fan base is black! The outcry was immense. Some called for disqualification of the team. Some called for the players to forfeit their next home game – the one we would be attending. We read about threats of boycotts and of sponsors withdrawing. It was a disaster for all at the club – not just the racist owner. We would get an indication of how the players and staff felt about the situation when they played game 4 on the Sunday afternoon. Prior to the warm up before the match, the players congregated in the centre of the court, and simultaneously threw their track suit jackets down on the ground, revealing they had turned their warm up t-shirts inside out to hide the Clippers logos. They were (justifiably) pissed off, and lost the game to make the series 2-2. Well, after spending over $100 each on tickets, it probably wasn’t that big a question – of course we would go. But, then we started reading the local news, with more calls for boycotts. We had some doubts creep in as to whether this was a good idea. However, I noticed one of the calls for boycotts was from the Warriors coach. You couldn’t help but think it was a ploy to upset the opposition. One of the suggestions in the news was to wear black in protest. I inadvertently complied with this request – I was at the end of a long trip and my black t-shirt was clean! Our first task for the day was to travel to CBS television city for a recording of “The Late Late Show with Craig Ferguson”. That was hilarious – he’s a brilliant comedian and his jokes in the ad breaks were just as funny as what goes to air, if not funnier! With big grins on our faces we got in a cab after the recording and went straight to Staples Center. The grins slowly faded as, in the cab on the way there, you could see on the driver’s screen warnings flashing to “Avoid Staples Center – Clipper protest”. On arrival the cab dropped us a short distance from the stadium – next to the convention centre – as you couldn’t get right up close to the stadium. As we walked up we could start to hear the chants – not chants supporting the team, but chants abusing Sterling. 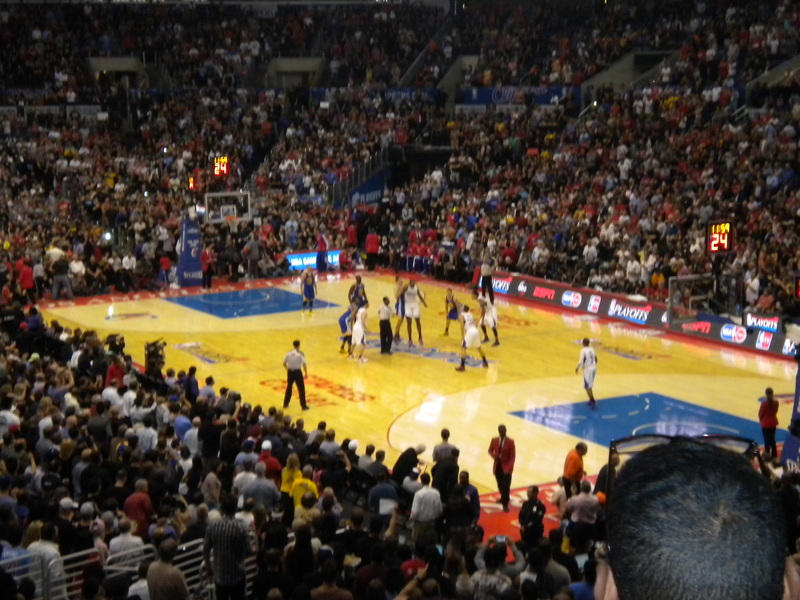 I also heard one of the protesters say on their megaphone “Why are all these white people going to the Clipper game?”. I wanted to answer “Because we’re Australians who want to watch some basketball and this was our one and only chance” but obviously I said nothing. We walked directly to the door and scanned our tickets. I figured once we were inside there wouldn’t be any protests. Inside the stadium was one of the most unique experiences I’ve ever had. I’ve been to some emotionally charged sporting contests before – the Troy Broadbridge game in the AFL and the Cricket Tsunami match at the MCG. This one had the same amount of intensity, but rather than mourning death, this seemed (sorry about the cliche) a rebirth. 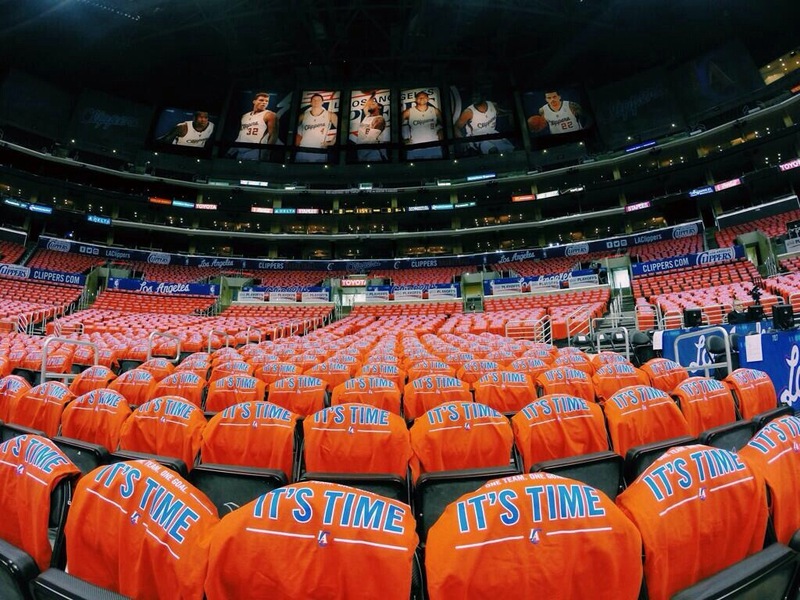 Prior to other games in the NBA playoffs, the stadium looks a bit like this – as free t-shirts decorate the stadium for the fans to unite in their team’s colours. was shown on the screen and the crowd cheered loudly. It was an amazing build up. Oh, and there was also a game of basketball. This had been a closely matched series, with both teams winning one home game and one away game each. On one side you had Blake Griffin and Chris Paul, and on the other you had Steph Curry, so we were watching some gun players in action. But, the player who impressed me most was DeAndre Jordan. He was on fire early, pulling out blocks and some amazing shots to get the Clippers out to a lead. Early on he ripped a rebound out of the hands of his opponent and the whole crowd went crazy. One thing you get from watching live sport is a greater appreciation of the role of each player. Sometimes, watching on TV, you just can’t pick that up. For example, watching Griffin’s positioning to be the guy who ploughs his way to the basket, as opposed to Paul or Curry who are being watched by everyone to be the go-to-man when the shot clock is almost done, because they can land it from anywhere. Well, early on Chris Paul wasn’t landing them from anywhere, but that’s where DeAndre stepped in! Coming from an AFL/VFL background, I’m used to watching games with half the stadium supporting one team and half the stadium supporting the other team. To come to America where the home advantage is so great was a very unique experience for me. 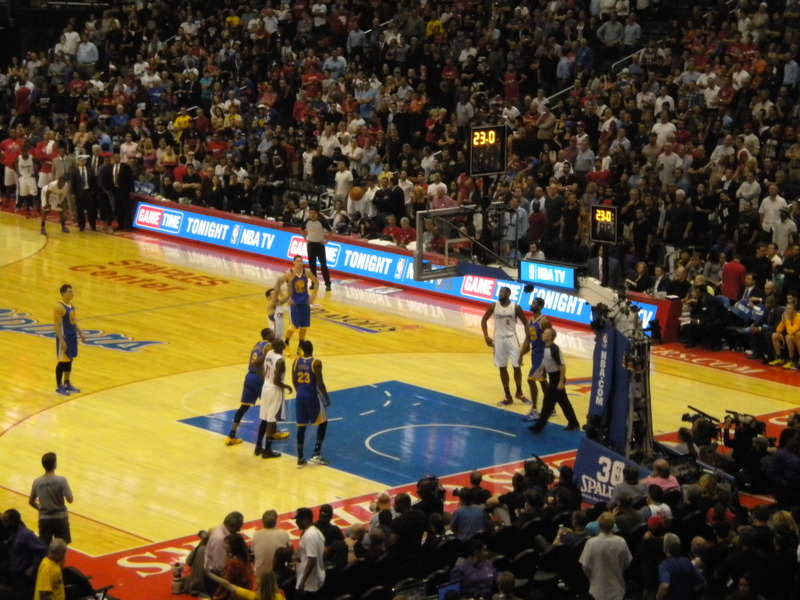 I loved hearing everybody chanting as the Clippers defended their end of the court. What a tremendous slap in the face to Sterling. 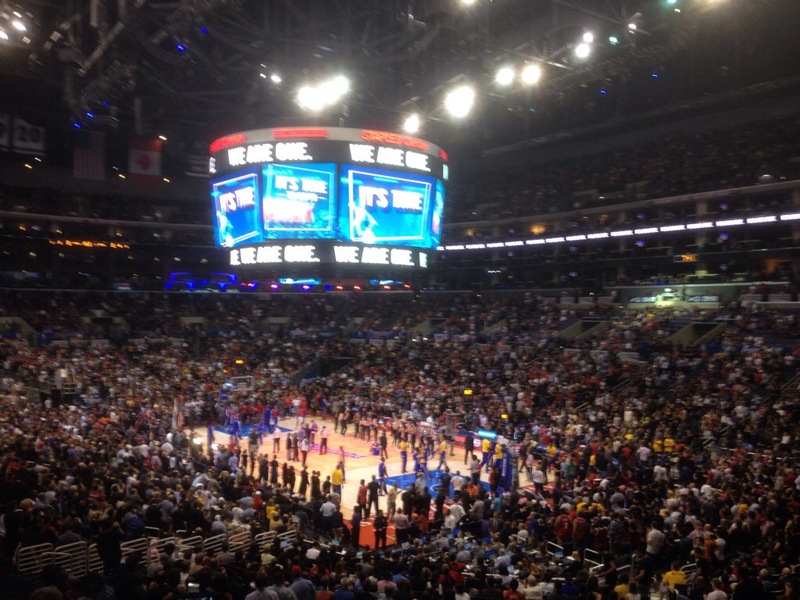 As the Clippers were challenged by the Warriors in the third quarter, this logo came up on the big screen and the DJ led the crowd in a chant of “We are one”. It was spine tingling. I tried to take a video of it. I’m not sure it captures it fully but it’s the best I could do! During the third quarter the Warriors got a run on and briefly held the lead. But, Chris Paul fired up late in the game and started landing some great shots. The lead grew again and stayed there. Because there was a decent margin, we didn’t see one of those game ends where there’s heaps of fouling and set plays. The Clippers got home comfortably and, after a quick celebration to acknowledge the fans, got off court to prepare for game 6. I was impressed by the physicality of some of the players, as well as the skill of others. I obviously loved the atmosphere. Doc said the crowd was "awesome" and "unbelievable"
If you want to read a proper review of the match, try this one from the Clippers website. For a more light-hearted look at the game, check out this one from Bleacher Report, which features some tweets with more signs and reactions from the game. Having seen one of the more interesting sports events of my life, you may think this is the point where I sum up the post by telling you how amazing the game was and how Americans are totally against discrimination. Wrong! After following the signs to where the cab rank allegedly was, we saw it filled with police cars and TV vehicles. We did a full lap of the stadium to find another rank and hailed a cab. The driver told us he was of Ethiopian descent. He then asked what the game was like, and if there were many protests. No sooner had we said that we agreed with the punishment handed out to Sterling, our taxi driver – a black man – proceeded to argue that the punishment was too harsh. He said that they shouldn’t take a team from someone because of a few comments. We wondered what was going on – why wouldn’t he be in favour of the punishment. The rest of the trip became surreal as he denounced the American school system – giving the example of how his son came home talking about homosexuality and how he “didn’t want his son taught how to be gay”. I was thinking of all the things we could say in response, but I decided to keep quiet and stay out of trouble. Geri was also fuming, and I encourgaed her not to say anything. 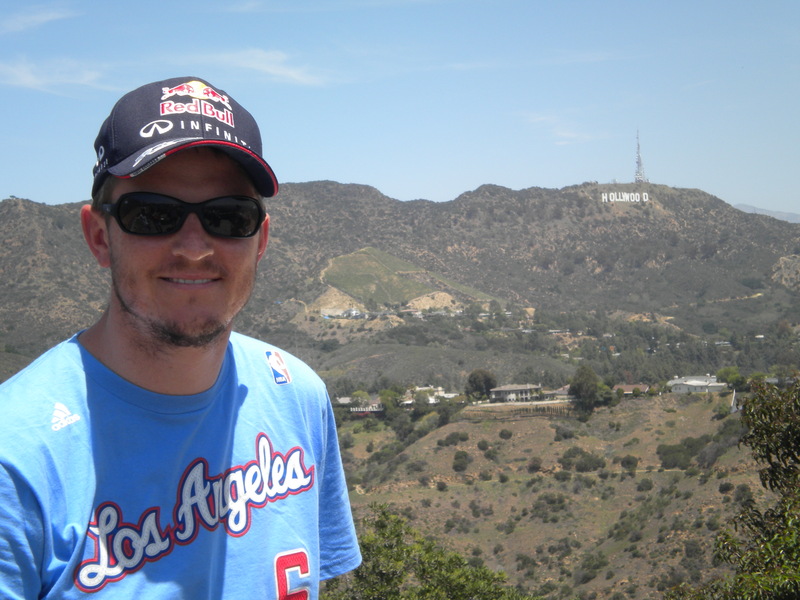 The next day – our final day in the USA, I wore the Clippers shirt I’d bought the previous night, with DeAndre Jordan’s name and number on the back. We took a Hollywood tour that had been recommended to us and the tour guide asked me if we went to the game (yes), if we knew about what had happened (yes) and what we thought of the atmosphere (awesome). The tour started well, visiting places where outdoor scenes of great movies were filmed, but when we got to the houses of the rich and famous, things began to take a turn. First, our guide defended Sterling, saying the comments were private, and to take his team away was stealing. Then, as we went past Sterling’s house (Funnily enough, the house was a lovely shade of… White), our guide told us about his black friends and how they probably wouldn’t have a problem with what Sterling did. An Aussie on the tour from Dubbo tried to say it was similar to an incident involving Eddie McGuire in Australia, and Eddie did nothing wrong. Finally, as the tour ended, our guide recounted a time he told a racist joke to rapper the Game‘s dad (about being shot at, and using black people as a shield) and he didn’t get it, but our guide reassured us it was “funny”. I was perplexed at the attitude. As Geri and I sat having a drink while waiting for our plane home, we recounted the tour and just how much of a contrast there was in attitudes. As for me, when I look back on that night, I think about how great it was to watch that game and be part of that atmosphere of people sending out a message that racism has no place in modern society. And then I wonder why there were those other people who didn’t get the message. But now, after some time to think about it, I realise why they don’t get the message – because I never told them the message. Am I complicit in the racism that took place in front of me because I didn’t pull it up? Perhaps. Actually, probably. While I was in a mindset of “lets not get into any trouble on our last night in the States”, I look back and realise that maybe there have been people who have done the same thing in front of Sterling all these years, which has allowed him to do what he has done, both in relation to the Clippers and some of his other business ventures. The lesson I learnt – it’s really important that when we see examples of racism, even when they are in private, that we call it out. It’s not acceptable. And I think that’s the main reason I wanted to finish this blog post after so many months. Not just to record what was a memorable night, but to acknowledge my failings that day as well. Obviously they didn’t get him, but still, there’s hope. With a takeover (worth a mere $2 BILLION!!) about to occur thanks to former Microsoft Man Steve Ballmer, and the retention of a number of key players (although the free agency period has only just commenced so there could be changes) there is real potential for the 2014/15 season, especially when freed of the burden of this controversy. Here’s hoping that the Clippers players can stay together, that the new ownership is settled quickly (although there’s still a court case to be run and won – there’s talk about Doc Rivers not coaching (and players not playing) if Sterling remains in charge, so let’s hope this is resolved very quickly), and they can attack the 2014-15 season strongly. And hopefully Donald Sterling is watching on TV, preferably on his own, when the team he used to own wins the title one day. 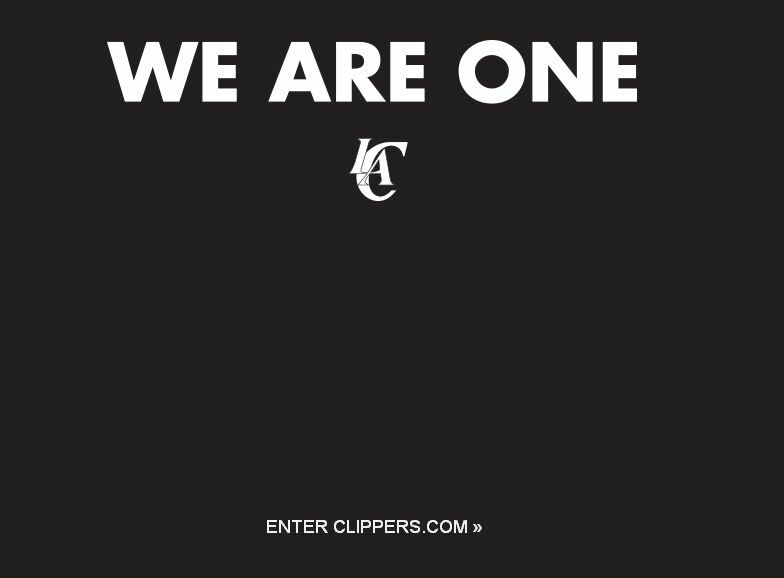 This entry was posted in Basketball and tagged basketball, blake griffin, chris paul, clippers, deandre jordan, donald sterling, game 5, golden state warriors, los angeles clippers, nba, racism, racists, staples center, steve ballmer, warriors, we are one. Bookmark the permalink.